Camille Saint-Saëns was a truly prolific composer, writing in most genres. He wrote twelve operas and collaborated with Dukas to complete Ernest Guiraud’s Frédégonde. Of his own operas only Samson et Dalila is today performed with some kind of regularity, but during his lifetime Henry VIII was a repertoire work and some scholars maintain that Ascanio, written immediately after Proserpine, is a much better work than even Samson et Dalila. Critic Henry Colles in his turn wrote at about the same time: ‘In his desire to maintain "the perfect equilibrium" we find the limitation of Saint-Saëns's appeal to the ordinary musical mind. Saint-Saëns rarely, if ever, takes any risks; he never, to use the slang of the moment, "goes off the deep end". All his greatest contemporaries did. Brahms, Tchaikovsky, and even Franck, were ready to sacrifice everything for the end each wanted to reach, to drown in the attempt to get there if necessary. Saint-Saëns, in preserving his equilibrium, allows his hearers to preserve theirs.’ Even though he was a modernist in his youth he became invariably conservative towards the end of his life, and most of his music is technically truly competent but rarely musically exceptional. It is easy to like but one is seldom overwhelmed by it. Proserpine was his sixth opera and it was a pleasant surprise. It is a relatively short work; with a playing time of just under 100 minutes it is comparable in length to Puccini’s La bohème. The setting is Italy in the 16th century and Proserpine, a courtesan, gives a feast in her palazzo. She rejects all her past or future lovers and only sighs “Sabatino has not come”. This young man is attracted by the courtesan and she is secretly in love with him, but then she learns that he is going to marry his friend Renzo’s sister Angiola who is in a convent in Turin. In the second act we meet her there when she is visited by her brother and Sabatino. He and Angiola express their love to each other and exchange rings. A group of pilgrims arrive, among them is the well-known villain Squarocca, who has been sent by Proserpine to find out who Angiola is. He quickly establishes that the girl is so beautiful that Proserpine may well die of jealousy. In the third act we are in the mountains, where a group of gypsies are dancing a tarantella. Proserpine, disguised as a gypsy girl is waiting for Squarocca. She is furious at his news but the villain has arranged that Renzo and Angiola pass by, their carriage breaks and Squarocca pretends to help Renzo repairing it. Instead he ties him to a tree. In the meantime Proserpine pretends to tell Angiola’s fortune and warns her that she has to break off the engagement with Sabatino. Angiola tries to escape and is stopped by Squarocca but Renzo has managed to free himself and rushes in and saves his sister. In the short last act we meet Sabatino in his apartment, where he is waiting for his bride-to-be. 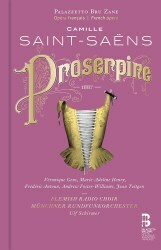 Instead Proserpine unexpectedly arrives and confesses that she has always loved him. He rejects her and asks her to leave through a back-door when he hears the carriage arriving. But Proserpine hides behind a curtain and observes the encounter between the lovers. She realises that they really love each other and attacks Angiola with a stiletto. Sabatino manages to prevent her from hitting Angiola and Proserpine stabs herself. Before she dies she wishes them a happy life together. I wonder what Massenet would have done with this libretto. A man of the theatre he was very adept at seeing the dramatic possibilities. Saint-Saëns didn’t possess those qualities. He was more an epic composer and even Samson et Dalila is closer to oratorio than opera. In Proserpine he manages, however, to create believable atmosphere and the end of the third act is truly dramatic. The entr’acte that follows is also intensely dramatic, foreboding the tidings in the last act. Elsewhere he fills the score with well-crafted and beautiful arias and ensembles and the first act is also filled with a great deal of festive music, light-hearted and entertaining and the act ends on a really joyous note. The opening of the second act, Prelude and Ave Maria, with women’s chorus, is really beautiful. Both this and the nun’s chorus towards the end of the act, decidedly point towards oratorio but the setting is no doubt just cut out for that. The lively and expertly orchestrated Tarentelle, which opens the third act, is a fine piece and Squarocca’s drinking-song in the same act also stands out. The four central characters all have grateful arias, and as a whole this is a musically rewarding score well worth investigating. Ulf Schirmer, who has set down numerous rare stage works, operas as well as operettas, has a firm grip of the proceedings and the live recording is excellent. There is not a trace of disturbances, not even applause at the end. Veronique Gens sings the title role beautifully and expressively and Marie-Adeline Henry is a charming Angiola. Frédéric Antoun is a virile Sabatino with brilliant top notes and Jean Teitgen is a sonorous Renzo. Andrew Foster-Williams is a gravelly Squarocca with rather unpleasant tone – but he is of course the villain. The light lyric tenor Mathias Vidal is a good Orlando in the first act. Readers interested in French operas off the beaten track should definitely give this issue a chance. The documentation is also worth mentioning. The 142-page hardback book contains, beside the libretto, “From genesis to reception” by Marie-Gabrielle Soret, “A look through the score” by Gérard Condé, “A few remarks on Proserpine” by Camille Saint-Saëns and “Proserpine, Goddess of the Underworld” by Hugh Macdonald and a detailed synopsis. A quality product indeed!